As the current superstar of the American dairy sector, when Chobani debuts a new product it always piques big interest. 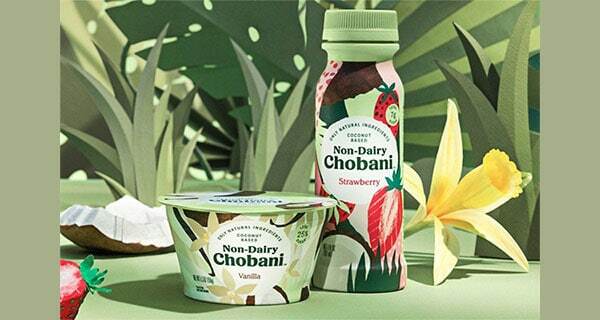 This year Chobani has just launched its first plant-based product, another bid to disrupt the Greek yogurt market they first built: Non-dairy Chobani. As the number one Greek yogurt company in the US, Chobani blazed a massive trail in the yogurt market space with their Greek yogurt. Over the past decade, it has focused primarily on innovating its own products including the Chobani Flip line. But in 2019, the company is shepherding consumers toward their newest plant-based innovation. Available nationwide in January 2019, Non-dairy Chobani maintains the Chobani promise to be non-GMO and all-natural. Even as it climbed to be the number two overall yogurt leader, Chobani took that future-oriented vision a huge step forward with the new coconut-based yogurt line-up that offers probiotics and less sugar in every spoonful. Chobani has removed dairy, lactose and reduced the sugar content to 25 percent lower than other non-dairy options. There are nine flavours including mango, peach, vanilla chai and slightly sweet plain. Always innovating and thinking about consumer perception and habits, Chobani has chosen to keep familiar yogurt packaging but avoid dairy-based words like “milk” and “yogurt”. While a 2018 Food and Drug Administration (FDA) notice on the use of dairy verbiage is at the forefront of plant-based product integration, Chobani’s labelling approach was consumer-driven in advance of the FDA notice. With their continued food transparency focus, the launch of Non-Dairy Chobani was designed to provide high-quality ingredients and clear consumer messaging. Chobani’s launch has been aimed at not just introducing a new plant-based product; but also at highlighting the differences, similarities and benefits of traditional yogurts and the new non-dairy version. While traditional plant-based products are made of ingredients like nuts and soy that don’t always create the right texture or taste, so Chobani focused on a smoother coconut base. Chobani executives saw an under-served consumer in plant-based and dairy-free options but also an overall increase in the trend of plant-based products. A recent Plant Based Foods Association report shows an increase of 9% in non-dairy milk sales and whopping 131% growth for plant-based creamers through the summer of 2019, while sales of cow’s milk fell 6%. Vegetarians and lactose-intolerant yogurt buyers are the primary customer for Non-Dairy Chobani but 2018 also saw consumers looking to reduce dairy in their diet for other reasons. A recent Mintel report found 17% of yogurt buyers reporting they ate less dairy as one of the reasons overall US retail sales of yogurt declined since 2015. Mintel predicted that market space would fall an additional 3.5% by 2020. Watching those trends meant Chobani saw the need for non-dairy options and answered with the same fervor they did in launching their Greek yogurt. “We have a belief: if we can’t make something better, we don’t make it at all. And for some time, we’ve felt that people deserve better non-dairy options,” said Hamdi Ulukaya, founder and CEO of Chobani. “We’ve come up with something that’s much better than what’s out there – a new recipe that’s absolutely delicious, but also meets our food philosophy of being nutritious, made with only natural ingredients and at a price that’s accessible to all.